Thanks to the kind folks at Rushcrowds, the boys and I made a spur of the moment decision to go along to Silvers Circus, Sunday just gone. I was lucky enough to pick up a free double pass from Rushcrowds which meant that all I had to do was pay the kids’ way, making it a really affordable outing. On entering the tent I realised that we were extra lucky, as we were shown to ringside seats. This meant that we were wonderfully close to the action. We were only centimetres away from being hit by flying hula hoops and rouge juggling balls and it made acts like the ‘Globe of Death’ particularly thrilling, being close enough to hear the crazy metal globe creak and sway as three motorbikes spun wildly inside it, sounding very much like a bottle full of angry bees. 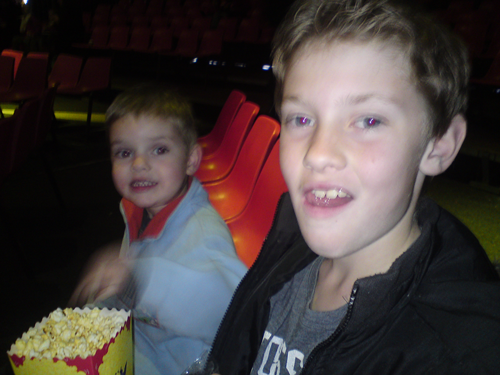 I’ll admit, I mainly agreed to go on this outing because Oscar kept shouting ‘circus, circus, circus’ like a madman every time we drove past Southland shopping centre, but I’ve got to say, once I was there I had as much fun as the kids. It’s been a very long time since I went to the circus, but the glitter and stage make-up, the costumes and general carny-culture immediately reminded me of what a big deal it is to go to the circus when you’re a kid. I was entranced and thoroughly entertained. Evan was too cool for school…he’d been to the same show this time last year and as such he kept offering up spoilers, telling me what was coming next. Oscar was wide-eyed, absolutely transfixed. He laughed at the clowns and clapped along on cue, but more often than not he sat with eyes wide and his little hand covering his mouth agape, a real mixture of enjoyment and trepidation. He had an absolute ball. The show itself includes a great variety of acts, and is suitable for all ages. In keeping with circus-norm, there are no animals, just a lot of clever people. The two-hour show was filled with juggling, extreme hula hooping, and magic tricks complete with white doves and beautiful vanishing magicians assistants. There were insane daredevils too, which had me on the edge of my seat. Evan thought I was a real dag when I covered my eyes, quite certain that the showy young man running the ‘Wheel of Steel’ was going to plummet to his death. Evan assured me that his stumbles were all part of the act, but I still I wasn’t so sure. I was quietly relieved when the act was over and done with, his feet firmly planted back on the ground. There really was something for all of us, and I’m really glad that we went. It was nice to do something a little unplanned on the weekend, and the boys really seemed to enjoy the afternoon out. Check out the Silvers Circus website for show times. 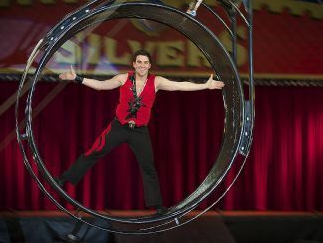 On the weekends, Silvers Circus run day-time shows, which are pretty perfect for the little ones. Also, don’t forget to keep an eye on Rushcrowds for discount tickets and free passes!